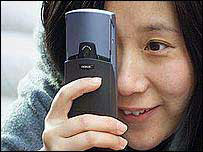 BBC NEWS | UK | Magazine | Quiz: Are you a mobile phones geek? Quiz: Are you a mobile phones geek? The launch of a chart for musical ring tones suggests we remain in thrall to the mobile phone. Test your knowledge of this ubiquitous modern accessory. Until now the charts were largely based on sales of the CDs, tapes and occasional record bought by the music loving public. Not any more. From Tuesday Music Week magazine will catalogue the best selling mobile phone ring tones for a regular fortnightly chart. It follows a rapid growth in the market, as owners of the latest phones take advantage of the hi-tech wizardry in their pockets to download tunes to amuse themselves and irritate others. So, are you in tune with all things mobile phone, or struggling to deal with those new fangled gadgets? Test yourself. Contenders for the first ring tones number one include Eamon and Frankee. But who is said to have had last year's top seller? Spending on ring tones has never been higher. How much did we shell out on them last year? The first mobile phone call was made in 1973. What was said? B: Have you thought about double glazing? C: Guess where I'm calling from? It can seem as though everyone has a mobile phone. But what is the real level of ownership in the UK? Which of the following mobile phone related stories is true? "The razor-toothed piranhas of the genera Serrasalmus and Pygocentrus are the most ferocious freshwater fish in the world. In reality they seldom attack a human." Discuss. In 1983 the weight of a state-of-the-art mobile phone was cut from 1kg to a mere half kilo. What would it have cost you to be at the cutting edge? Mobile phones are quickly being adopted in countries all over the world. Which of the following stories is true? The British sent over two billion text messages over the last year. Rank the following events, most messages first.